Are you a Google AdSense Publisher? If so, and you’d like to use your Google AdSense ad code with your Strikingly site or blog, you can check the following instructions. What type of Ad Units can be used? Automatic size/Responsive Ad Unit - We recommend this type as our websites are responsive as well. By choosing this size, ads will automatically fit the page/section, depending on the screen size of the device used to view the site. Page Level Ads - Allows you to use a single set of code that would work for the entire site. Pick the “Responsive” option and customize the ad, based on your preferences ie “Text ad style”, Backup ads, etc. Click “Save and get code”. Copy the code and paste it in a notepad. 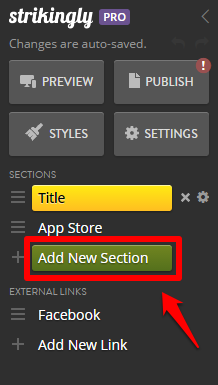 Go to your site editor and click “Add new section”. Pick the “App Store & HTML” section. Mouse over the newly added section, click “Edit” and select “HTML” from the available apps. Preview your site to see how it looks on PC. Note: The preview for tablet and mobile will not automatically resize the ad unit as technically, the site preview is still being viewed on a larger screen (laptop or PC). The ad unit will look cropped. To see the resized ad, publish the site and access on a mobile device. Publish your site when you’re done editing! Go to your Blog Manager and edit any of your blog posts. Hover your mouse pointer on the “App Store & HTML” element and click “Edit”. Choose HTML and paste your ad code in the HTML box. Click “Save. Preview your blog post to see how the ad will look on the published blog. Page-level ads are ad formats that lets you add a single set of code to your site. The code is added to a site only once and updates automatically when the add setting is changed. The page-leve ads will work on any page on a multiple-page site and this type of ad only works on mobile. In your Google AdSense account, click “My Ads>Page-level ads”. Click the toggle button for either “Anchor/overlay ads” or “Vignette ads” to enable. You may also use both at the same time. Once enabled, click the “Get code” button. Copy the code and paste it on a notepad. Go to your site editor and click Settings>Advanced>Custom Code>Header Code. Paste the code you generated into the Header Code settings and Click “Save”. That’s it! Your ads should be visible on your site. In case you need help, send us an email at support@strikingly.com or chat with us.